24Option are one of the leading online brokers. They boast some of the latest technology on their trading platform and pride themselves on offering an easy to use system. The new bespoke platform is also feature rich and advanced. The firm operates under the company name Rodeler Limited and has headquarters in Cyprus. The firm are regulated by CySec but have stopped offering binary options. They have added both CFDs and Forex trading to their offering, and also expanded their customer support to include management of large investing portfolios. While they will continue to offer existing client binary trading, their focus is now on CFD and Forex trades. This includes Bitcoin forex pairs. They aim to offer a user friendly trading service and also give traders the tools they need to make a profit – including some of the highest limits in the industry. Bonus details – As a CySec regulated broker, 24option no longer offer bonuses or trading benefits. 24Option offers a user-friendly platform aimed at quick, easy trading, as well as a mobile trading app. Traders can choose from four trade types and a complete range of expiry times. These can be as short as 60 seconds, and as far ahead as a week or longer on certain assets. Payouts will vary based on the underlying asset and expiry time, but the platform does have high payout levels relative to their rivals. Forex and CFD payouts will depend entirely on the movement of the underlying asset, as with any other broker. The trading area is clearly laid out. Traders are able to select the underlying asset they want to trade, either directly from the list, or by filtering the display down to the class or category wanted, via a drop down menu. The trading window is always visible, next to the list, and will update as soon as a different stock or underlying asset is selected. The price graph on the trading window can be enlarged, to allow a more detailed analysis of price action. Below the trading window is the open trades area. From here traders can see all the trades they have open. These are flagged as to whether they are currently in the money or not. The opening price and current price are both displayed, as is the expiry time. Also, the open trades window will display a ‘Close’ value – that is a value that the trader can ‘cash in’ at that moment – either to lock in a profit or reduce a loss. These are only offered at certain times within a trade, but add to a trader’s options and are handily placed. Trade history is also shown in this area. All completed trades are listed, open and close prices and of course, the net result of the trade. There are also three tabs for traders to keep informed of markets changes. A trading alerts tab, a daily market updates tab and the very useful Economic calendar tab. This provides a great source for finding the key financial statements that will get released to the markets in the near future. The platform delivers binary options on forex, commodities, selected stocks and indices. In addition, the firm now also offer CFD trading and forex trading “per pip”. This allows users to trade in a more traditional way. It also allows users to trade using leverage. This is a big difference if traders are more used to the ‘fixed risk’ of a binary option. As part of the forex push, 24option now also provide Bitcoin forex pairs. This allows traders to take a position on cryptocurrency versus USD or GBP for example. As the CFD offering is relatively new, more markets will be added over the coming month. Spreads are currently around .05% and compare fairly well with more established cfd brokers. This new types of trade also include the option to set stop loss levels. This is a key part of risk management when using leverage. Traders can also set ‘take profit’ points too. 24Option provide a slick and easy mobile trading platform, it will work with both android and apple devices. If logged in to the full website, traders can see a demo of the mobile app. Customer can also choose a variety of devices for that demo. The application has a very simple interface, with each stage of the trading process laid out in a clear simple process. Screens are large and easily useable. This reduces risk of mistakes due to fiddly or hard to find buttons. As well as easy trading, the app can also display the trading history, and open trades. So trade history can be checked wherever a trader may be. It is a slick trading app and is a great addition to the range of features offered by the brand. It has been created with the trader in mind, but has been thoughtfully developed to ensure it offers a full range of functions across multiple devices. 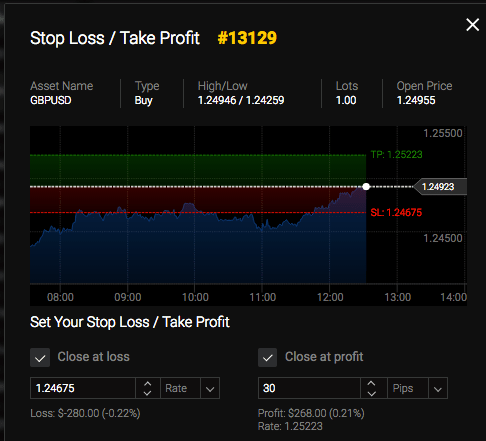 Traders can manage risk via tools such as stop losses. They can also choose the level of leverage to use, per trade. With CFD and Forex however – losses can exceed initial deposits. 24option offer a variety of deposit and withdrawal options. Withdrawals are normally sent back to the source of the funds. The accounts do require some form of valid ID, and proof of address before making withdrawals. This is to comply with money laundering laws. If funds were deposited via credit card, details for that card will also be required for the withdrawal. Withdrawal problems and complaints generally revolve around delays in this proof of identity process. So it is worth sorting out prior to asking for a withdrawal. This can avoid problems and ensure quick withdrawal times. Gold and Platinum account holders can enjoy regular free withdrawals. Standard account holders receive their first withdrawal free. Remaining withdrawals may incur a percentage charge and this figure will depend on the method used – Skrill for example, will incur a 2% charge. Withdrawal requests can be made at any time. Traders can make a deposit at anytime too. The minimum deposit is £250 (funds can be deposited in USD and EUR too – but once set the currency that an account operates in cannot be changed). 24 Option are keen to stress the security of the deposit process, and do make it as easy as possible to deposit funds. Once the minimum deposit is made, the funds appear straight away so traders are not delayed in taking out options. 24Option recently announced that CFDs (Contracts For Difference) had been added to their platform. The trading area has now been redesigned in-house (rather than the previous TechFinancial platform), and they have improved their platform to now include the option of trading CFDs. While the initial offering is fairly limited, it is an interesting step from the firm, and is an area of trading which is likely to expand within the binary sector. The key difference with both the CFD and Forex platforms is that traders can use leverage. Levels up to x200 are available. This is a big change for anyone used to the fixed risk nature of binaries. Traders should understand this difference. The platform also offers stop loss tools – a must have for the added risks with leverage. Multilingual support – The brand is an international business, offering trading support in a range of different languages including English, Spanish and Italian. 24/7 trading – They offers 24-hour trading. Education centre – The website hosts a range of educational resources catering to traders at all levels. These include regular market updates, educational videos, eBooks and a beginners’ trader manual to get you started. They are owned by Rodeler Ltd, who are based in Cyprus. They are regulated by CySEC, but do have offices across Europe, including Ireland. The London office has been closed however.